Millions in Kerala are still stuck in the relief camps. The massive flood destroyed lives as well as property. In some areas, the flood water reached so high that if engulfed two-storey buildings. The water level in slowly coming down, and soon the rescued people will go back to their homes. These homes will require sanitization and refurnishing to make them habitable again. For the assistance of flood hot victims, state government has announced an interest free credit scheme. 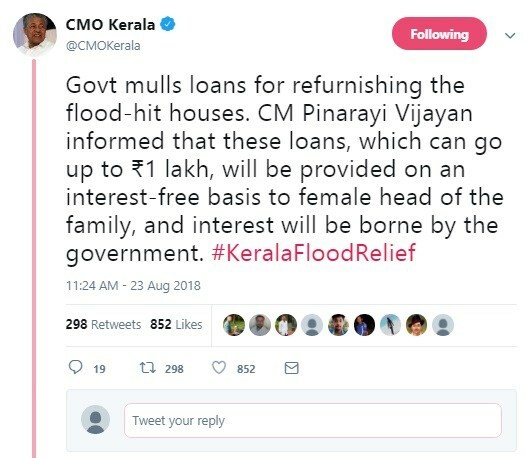 The Interest Free Loan Scheme is designed for women and the money must be utilized for refurnishing the affected homes. Supporting flood victims – The main objective of this scheme is to offer assistance to the people whose homes have been destroyed or damaged in the recent floods. The money can be used to pay for the necessary repair works and refurnishing. Financial assistance – It has been mentioned that each applicant will receive as much as Rs. 1 lakh under this scheme. No interest payment – The state government announced that this credit will be given at zero percentage interest. It will be the responsibility of the authority to pay the interest on behalf of each applicant. The interesting aspect of this scheme is, only the eldest female of the house will be able to apply for this credit scheme. The state government has been working on women empowerment for some time now. The launch of this scheme is a step towards this as well. Though nothing has been said about the list of papers required, it is evident that applicants will have to submit their Aadhar cards and residential proofs. Apart from this, authority might require evidence of the damaged home. After the applicants sanitize and refurnish their homes, the state government will also offer them a food kit. This kit will contain 5 kg rice. All power generation and distribution stations have been badly affected due to this massive flood. But the state is working on a war footing to restore power in all areas as soon as possible. Lack of power will slow down the rescue operations. As of now, 41 power stations have gone online. The power department has also installed 13,477 new transformers for stable and continuous electricity supply.